I ran across this at work yesterday and thought it was pretty sweet. (Click on the image to view a larger version of it) I thought it would be interesting if someone did a 2009 rendition. Notice the Market House that used to be in the center of Market Square and the trolleys on Gay and Union. I wish I could have seen it all like this. weird, but Hope Bros Jewelers is in the wrong location! Unless they moved into a different location, they opened Hope Bros Jewelers where Sapphire now lies. Eventually bought by Kimballs in the 30's. It's interesting to see the Market Square area without the TVA buildings in the way. In most cities that serve as the county seat, you'd probably find the courthouse where the Market House is. I wonder why Knoxville was different. i like the "riveria photo plays" and the "farragut coffee room"
I find it interesting that Coffe and Chocolate moved into a bulding that used to be "Quality Breads and Cakes". 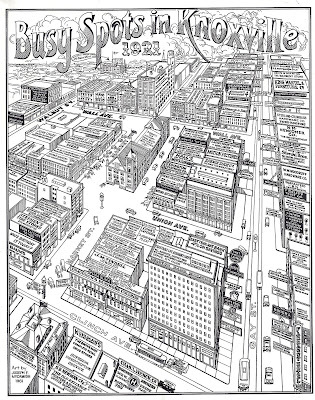 A 2009 version of this would have parking garages on about half of the map. It's sad that people were so short sighted and tore down so many of these great buildings and replaced them with parking garages. Downtown would be so much greater now if there were more old buildings. Pianoman, I agree that it's a shame any great old building is torn down, but where would you propose people park? I wish we could say Knoxville didn't need the parking garages, but they're vital to bringing people downtown -- and we obviously still don't have appropriate parking (see posts about 100 block of Gay Street). Just playing a bit of devil's advocate. It's not just parking garages that claimed the land from old buildings, like all the buildings along Wall Ave. are now home to TVA's buildings. We replaced great human-scale buildings with buildings that don't fit that bill. As for parking, there are ways to get people into downtown without replacing what people like about downtown with parking garages. If Knoxville had a decent transit system, or useful bicycle and pedestrian infrastructure, etc, then there wouldn't be as much need to provide for the automobile. Knoxville has alot going for it, but, like so many other cities, it jumped on board with city planning ideas of yesteryear that catered to the automobile and not the people. B, I sent this image to a local dignitary who might be interested in purchasing a copy. Can you tell me how they might get ahold of one? You can buy a copy of the original (not the 1981 trace-over copy) from http://reevesmaps.com/knoxville.htm. There's a copy of this hanging in Mast General Store in the back. Found it so fascinating that I ended up looking at it for twenty minutes, looking like the creepy guy hanging out by the bathrooms. Like many cities, it seems like Knoxville shot itself in the foot with 1960s style urban planning. The TVA towers and the City County Building are two prime examples of mega buildings that don't fit in with the scale of the city. As far as parking garages go- i think you can intelligently integrate them into city blocks, "filling in the donut hole" that most blocks have while keeping the street front filled with shops and residences, e.g. the block between central and state st. would be perfect. Just keep garages off the streetscape, or else you end up with dead blocks like Clinch near the YWCA. I think the automobile and the pedestrian can be equally catered to, but it has to be a thoughtful, fine-grained approach to city design. does anyone know what the significance of 1921 is? CK: It is interesting, though, that both TVA and City County Building are Bruce McCarty designs. Your comment specifically relates to the scale of the buildings vs. the city as a whole, but it's interesting to note what I'm sure you're aware of - that McCarty designed specifically with an intent to create efficient community-focused, functional spaces. Even if your contention is that these buildings aren't successful, it seems that the planning failure was at least well-intentioned. wax: Funny thing is, I'm a fan of Bruce's. His small scale projects are awesome. But he was a product of his time: little to no context recognition, especially to urban areas. He seemed to love trying to create interior public spaces, but the "extension" of Market street in the C&C building is tenuous at best, and the TVA plaza is more of an urban wall intead of continuing Market Square's space. With one notable exception of his (I spent 5 years in it), his experiments at urban connection are largely failures. A brilliant architect, but a poor (well intended) urban planner.